Pope Francis has urged that "news be communicated with serenity, precision and completeness, using a calm ‎language in favour of a fruitful reflection; thoughtful and clear words, which reject the tempers of ‎allusive, clamorous and ambiguous speech, Pope Francis told representatives of Italian periodicals on Saturday. “It is important that the criteria of judgment and information are offered patiently and methodically so that ‎public opinion is able to understand and discern, and is not stunned and disoriented,” the Pope told some 350 members of the Italian Periodical Press Union (USPI) and the Italian Federation of Catholic Weeklies (FISC) who met him in the Vatican. The Pope told them that they have a mission to inform properly, to offer everyone a version of the facts as close as possible to reality. “Your free and responsible voice,” he said, “is fundamental for the growth of any society that wants to be called democratic, so that a continuous exchange of ideas and a profitable debate based on real and correctly reported data are assured. The Holy father also urged that the right to information and the dignity of every single human person be “scrupulously respected” so no one risks being damaged in the absence of real and responsible circumstantial evidence. He said, “There is no need to fall into the ‘sins of communications’: misinformation, that is saying only a part which is calumny and which is sensational, or defamation that seeks out things past and old and bringing them to light today.” “They are very grave sins that damage the heart of the journalist and damage the people,” the Pope added. At 10:30 this morning, the Holy Father Francis received in audience, in Paul VI Hall, the children assisted by “Saint Martha’s” Paediatric Dispensary. Here is a ZENIT translation of the Pope’s impromptu greeting to the volunteers, the parents and all the children present. Good morning! Children’s joy . . . Children’s joy is a treasure — joyful children . . . And we must do everything we can so that they continue to be joyful, because joy is like good earth. A joyful soul is like a good earth, which makes life grow well, with good fruits. And that’s why this celebration is being held: the closeness of Christmas is always sought to gather us to hold this celebration for them. In order to help faithful and little ones prepare for the true meaning of Christmas, Pope Francis has given faithful, and little ones, advice, during today’s Angelus. Today, Gaudete Sunday, is the traditional Bambinelli Sunday, when children from across Italy bring their figurines of the Baby Jesus for a blessing at the Angelus in St. Peter’s Square. In his address to the faithful in St. Peter’s Square, Pope Francis reminded faithful that the past Sundays, the liturgy has stressed what it means to put oneself in an attitude of vigilance, and what it entails concretely to prepare the way of the Lord. "POPE FRANCIS ANGELUS 2017- 12-17"
In difficulties, in troubles, in darkness, we learn from St Joseph who knew “how to walk in darkness,” “how to listen to the voice of God,” “how to go forward in silence.” That was Pope Francis’ reflection during the morning Mass at the Casa Santa Marta, commenting on the day’s Gospel. Jesus, he explained, was born of Mary, the spouse of Joseph, the son of David. Vatican City, Dec 16, 2017 / 12:53 pm (CNA/EWTN News).- The relics of Christian saints and blesseds deserve special care and their authenticity must be certified by the Church, the Congregation for the Causes of Saints has said. “Relics in the Church have always received particular veneration and attention, because the bodies of saints and blesseds, destined for resurrection, were on earth the living temple of the Holy Spirit and the instruments of their sanctity, recognized by the apostolic see through beatification and canonization,” said the Dec. 16 instruction from the congregation. The instruction was sent to Catholic bishops, eparchs, and those who take part in procedures related to relics of saints, blesseds and those declared venerable and servants of God, Vatican News reports. It contains 38 separate items. Among its directives: relics of saints and blesseds that lack a certificate from church authority cannot be exposed for the veneration of the faithful. Pope Francis on Tuesday told the faithful that God is fruitful and wants us to be so too, living for others and giving life. Sterility and fruitfulness were the two words at the heart of Pope Francis’ homily as he reflected on the births of Samson and of John the Baptist, both of them borne to sterile women, as recounted in the readings of the day. He commented on how in those days sterility was considered a shame while the birth of a child was seen as a grace and a gift from God. The first commandment that God gave to our fathers, the Pope said, was “Fill the earth, be fruitful!” and he said that “Where there is God there is fruitfulness”. The Pope said there are countries that come to mind “that have chosen the path of sterility and suffer from that serious disease that it a demographic winter (…) They do not have children”. Pope Francis on Tuesday received King Abdullah II of Jordan in an audience at the Vatican. Pope Francis on Monday took 27 men and women a step closer to sainthood. The Pope received Card. Angelo Amato, the Prefect of the Congregation for the Causes of Saints and authorized him to promulgate 12 decrees regarding 22 men and 5 women from as many as 8 nations. They concern 3 miracles, a martyrdom and 8 heroic virtues. Nineteen candidates, including 3 miracles and the martyrdom of 16, have been cleared for Beatification, the penultimate stage before Canonization or sainthood. Among the 12 is the decree on the heroic virtues of the noted “Rosary Priest”, Servant of God Fr. Patrick Peyton of the Congregation of Holy Cross (CSC). Pope Francis will make a pastoral visit in the footsteps of St. (Padre) Pio of Pietrelicina on 17 March 2018. A statement from the Director of the Holy See Press Office, Greg Burke, says the Holy Father is to visit the Italian towns of Pietrelcina and San Giovanni Rotondo on 17 March 2018. The year marks the 100th anniversary of Padre Pio of Pietrelcina receiving the stigmata, as well as the 50th anniversary of his death. At his General Audience on Wednesday, Pope Francis continued his catechesis on the Holy Mass, beginning a series of reflections on the various parts of the liturgy. Cardinal Bernard Francis Law has died in Rome following a long illness. Archbishop emeritus of Boston and Archpriest emeritus of the Basilica of Saint Mary Major in Rome, he was 86 years old. Ordained priest in 1961, he was appointed Archbishop of Boston in 1984 where he worked to promote ecumenical dialogue and Catholic-Jewish relations. In 2002 he resigned from his position in Boston following accusations that he had covered up cases of abuse against minors. The Vatican’s Office of Papal Liturgical Celebrations said funeral services for Cardinal Law will take place in St. Peter’s Basilica on Thursday, 21 December. Cardinal Angelo Sodano will preside over the Mass, while Pope Francis will celebrate the rites of Commendatio and Valedictio. In his homily at the morning Mass at the Casa Santa Marta, Pope Francis called on Christians to be joyful, and said pessimism is not Christian. Pope Francis met with Vatican employees on Thursday to exchange Christmas greetings, during which he made several off-the-cuff remarks. Pope Francis on Thursday exchanged Christmas greetings with Vatican employees thanking them for the work they do. “Work is the first word that I tell you, not to tell you to work more, but to tell you ‘Thank you!,” he told employees and their families gathered in the Vatican’s Paul VI audience hall. ROME - From the beginning, Pope Francis has been a maverick leader, running against “the system” and making it clear he’s got no special loyalty to the Roman Curia, meaning the ecclesiastical bureaucracy in the Vatican. 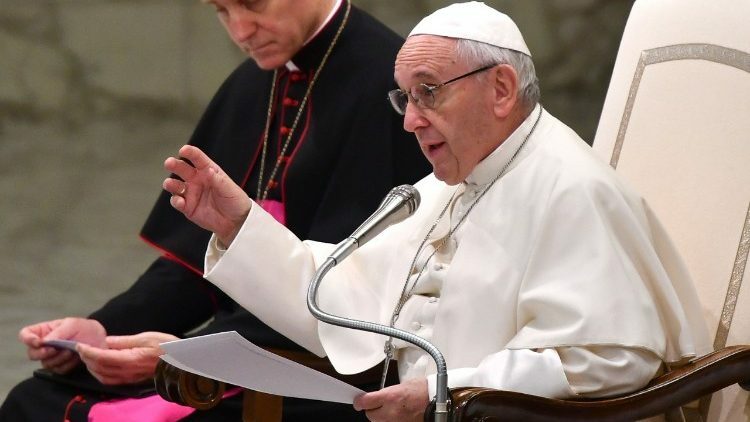 As a result, his annual Christmas speech to the curia has become an anxiety-inducing event for many, wondering what new ways the boss might find this time to excoriate and cajole them. This year, however, Francis didn’t seem to have the curia tout court in his sights, so much as elements within it that he seems to believe are creating obstacles to his desired reforms. It was a back-handed way for the pontiff to concede that his much-vaunted clean-up operation in the Vatican has been uneven, perhaps never more so than in the past year, which saw promised reforms stalled and key personnel depart under mysterious circumstances. At the moment, two of the three key agencies created by Francis in 2014 to lead his financial reform, the Secretariat for the Economy and the independent Auditor General’s office, are without their senior leadership, while real power had steadily re-accumulated in the Secretariat of State. ROME - Before an unusually small congregation of mourners, albeit one that featured U.S. Ambassador to the Holy See Callista Gingrich and her husband, former House Speaker Newt Gingrich, a funeral Mass for Cardinal Bernard Law was celebrated behind the main altar in St. Peter’s Basilica on Thursday afternoon. Pope Francis took part in the ritual, not celebrating the Mass but offering final prayers at the end, reading the prescribed prayers for the final commendation of the deceased to God and the final valediction. The Vatican’s foreign minister, British Archbishop Richard Paul Gallagher, was also on hand for the funeral Mass. In his homily on Thursday for the funeral Mass, Sodano appeared to allude to Law’s association with the abuse scandals in the United States, saying that cardinals too make mistakes and fail, and adding that’s why Catholics include a confession of sins at the beginning of every Mass. Thursday’s Mass was not broadcast over any of the Vatican’s media services, as funeral Masses for deceased cardinals generally aren’t carried, and likewise Sodano’s homily was not distributed through Vatican media channels. Pope Francis prayed at the end: "May he be given a merciful judgment so that redeemed from death, freed from punishment, reconciled to the Father, carried in the arms of the Good Shepherd, he may deserve to enter fully into everlasting happiness in the company of the eternal King together with all the saints." We bring you the official English translation of the full text of the sermon prepared and delivered by the Preacher of the Papal Household, Fr. Raniero Cantalamessa OFM Cap., on Friday, December 22, 2017, in the Redemptoris Mater chapel of the Apostolic Palace. The new U.S. 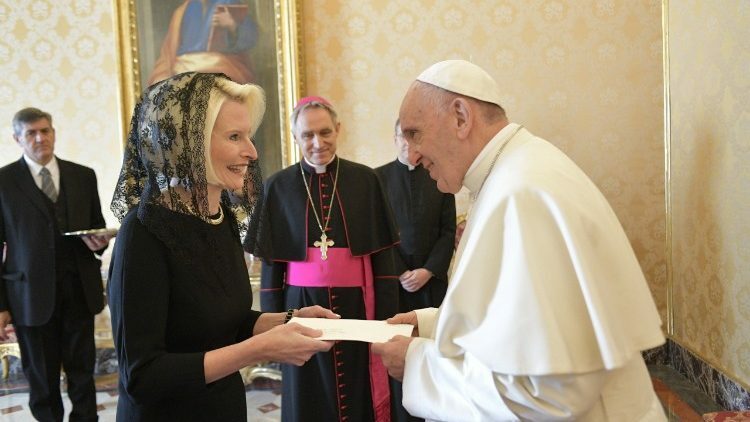 Ambassador to the Holy See, Callista L. Gingrich, presented her credential letters to Pope Francis on Friday morning. The ceremony took place in the Vatican’s Apostolic Palace. Her main responsibility as Ambassador will be to serve as the liaison between the Holy See and the U.S. Government. Ms. Gingrich was nominated to the post by U.S. President Donald Trump in May and confirmed by the Senate on 16 October. The Pope did not change his Master of ceremonies and, already three months ago, he reconfirmed for another 5 years, Monsignor Guido Marini, from Genoa, at the head of the office of the papal liturgical celebrations since 2007. In recent weeks, even though Marini had been already re-confirmed, rumours on a possible change had spread inside the Vatican palaces. Actually, the relationship between the Pope and his master of ceremonies remains solid and Francis quite appreciates the fidelity of Monsignor Marini, who is tasked with overseeing every papal liturgical celebration: both those that take place in the Vatican and Rome, and those "out" of the Country. VATICAN CITY (CNS) -- Blessed Paul VI could be declared a saint in 2018, perhaps during the Synod of Bishops, an institution he re-established after the Second Vatican Council, according to the newspaper of his home diocese. La Voce del Popolo, the newspaper of the Diocese of Brescia, Italy, reported Dec. 21 that the medical commission and theological commission of the Vatican Congregation for Saints' Causes both gave positive opinions about a healing that could be the miracle needed for the pope's canonization. The cardinals and bishops who are members of the congregation still need to vote for recognition of the miracle, and Pope Francis also must recognize it before holding a consistory to formally approve the canonization.